New Jersey criminal defense attorney representing individuals and institutions charged with healthcare claims fraud in the state and federal courts of New Jersey and New York City. What is healthcare claims fraud? Healthcare claims fraud is a type of insurance fraud, and is typically viewed as a "white collar crime". In part because of ever-rising healthcare costs, both state and federal authorities aggressively investigate and prosecute efforts to defraud private insurance carriers and government agencies by means of false claims for health-related services and products. In its most general sense, healthcare claims fraud involves intentionally filing false or fraudulent claims for health or medical products or services for the purpose of obtaining payments that the filer is not entitled to receive. As a result of increasing efforts to prosecute these cases, things that were once viewed as minor billing errors are now frequently prosecuted as attempts to fraudulently obtain payment from an insurance company or government agency. What are some types of conduct that can be considered fraudulent? Misrepresentation of an employer group to obtain coverage. What are the penalties for healthcare claims fraud? The fines and penalties for healthcare claims fraud can include jail time, as well as substantial civil and criminal monetary penalties. Defendants found guilty of these offenses can, under certain circumstances, be required to reimburse the defrauded victim of whatever monies were paid out. 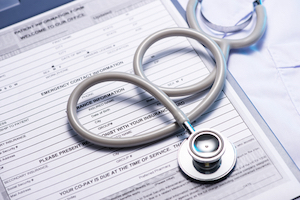 What are some of the special concerns for licensed professionals charged with healthcare fraud? Healthcare claims fraud presents special issues for licensed professionals, including doctors, dentists, physical therapists, psychologists, social workers or other mental health professionals, nurses and eye care providers. In addition to the penalties usually imposed in healthcare claims fraud cases, these professionals can face the suspension or revocation of their license. Thus, a licensed professional may not only be required to appear in court in connection with a criminal case, but can also face disciplinary proceedings before their licensing authority. Is the defendant or subject of the investigation always an individual? Defendants or subjects in these cases are not always individuals. Institutions such as hospitals, clinics, outpatient surgical centers, nursing homes and durable medical equipment retailers can also be charged with healthcare claims fraud. What should I do if I am being investigated or charged? If you or your institution are being investigated for healthcare claims fraud, the best course of action is to seek legal representation immediately upon learning of the probe. If possible, don't wait for charges to be filed. If, however, you or your institution have been charged with healthcare claims fraud, the best course of action is to seek aggressive representation from an experienced criminal defense attorney. Criminal defense attorney James S. Friedman, Esq., has considerable experience defending healthcare claims fraud cases in both state and federal court. If you have been charged with healthcare fraud, or you or your institution or business is being investigated, DO NOT ATTEMPT TO DISCUSS OR EXPLAIN THE SITUATION WITH THE INSURANCE CARRIER, GOVERNMENT AGENCY OR INVESTIGATOR. Instead, contact Mr. Friedman immediately to start planning an aggressive defense.